My friends know this: I’m addicted to Nissin Cup Ramen. There’s something about the aroma after I’ve waited that obligatory 3-minutes for the hot water to soften the noodles and bind the various spices and ingredients in a flavor that instantly gratifies me. This is not a universal addiction to Cup Noodle. It has to be made in Japan – the ones manufactured elsewhere are probably catering to local tastes, and to my palate, pale in comparison. I don’t believe they manufacture the King Size version anymore, but if they did, I’d buy. Nissin Cup Ramen also tends to have the coolest commercials. One released in November, 2016 is not only super fun, it is appealing to the same demographic the Tokyo 2020 Olympics are trying to appeal to. In a somewhat tenuous take on The Seven Samurai, Nissin created a commercial that features athletes decked out in traditional armour that the West now associate with the warrior class known as the samurai. And the seven featured in this commercial are magnificent! 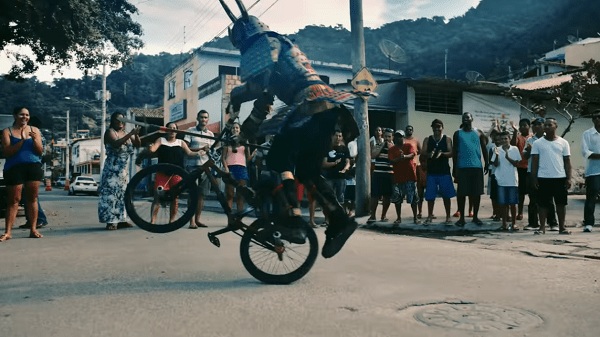 They surf, they skateboard, they pogo-stick over street vendors, they spin on their bikes, do acrobatic twists on skis to the amazement of the bewildered crows around them. Over the decades, the IOC has worked with host countries to appeal to the youth, and ensure a market for their product for years to come. The X-Games, an ESPN-sponsored event featuring extreme sports, drove up the popularity of skateboarding and freestyle motocross. Thanks to growing popularity of these youth-driven activities, snowboarding became an Olympic sport in 1998, while BMX cycling debuted at the 2008 Olympics. Tokyo 2020 will feature a bevy of new competitions that the organizers hope will build a new generation of Olympic fans, including surfing, skateboarding, and sports climbing. Posted in Japan, Other Olympics, Pop Culture, Tokyo 2020 and tagged armour, ESPN, Nissin Cup Ramen, samurai, Seven Samurai, skateboarding, sports climbing, surfing, X-Games. Bookmark the permalink.